It’s 2 a.m. in New Delhi, halfway through a hot night in August 1967, and Mike Hynson is still awake and sweating in his hotel room. The pressure is on—it’s a feeling of impending doom that Hynson, a fearless surfer whose quest for the perfect wave had been captured in the 1966 cult classic The Endless Summer, has never encountered before, certainly never while simply working on a surfboard. But this is no normal surfboard-repair job. Using a spoon he borrowed from the hotel restaurant, Hynson has carved a giant chunk of foam out of the bottom of one of the boards he’d delivered to India a few weeks earlier. He’s filled the hole with a watertight bag of hashish oil that he and a friend from Laguna Beach obtained in Kathmandu. He seals the compartment shut with carefully concealed tape and resin. But time is conspiring against Hynson. He still has two more boards to go before dawn, when he has to catch a return flight to California. The trio of hash-laden boards he’s busy preparing are supposed to arrive on a cargo flight a few days after him. His brown wig and fake mustache—which he wore for the photograph that adorns his phony passport—await his attention. He must not forget to wear them to the airport. As Hynson hunches over his hollowed-out board, a thought keeps parading through his brain, over and over like a mantra, until he feels as if every nerve in his body is about to snap. Stepping inside Hynson’s garage at his house in Encinitas is like entering a strange world where Southern California surfing history, 1960s counterculture and Hynson’s renegade sense of humor all compete for surface space. There’s the red pirate flag hanging over the door with the words “Prepare to be Boarded” splashed above a skull and crossbones. Faded portraits of Hindu swamis hang above a tray of expired incense, next to a blown-up photograph of a 24-year-old Hynson with a bunch of his friends—Robert August, Bruce Brown, Hobie Alter, Corky Carroll and Phil Edwards—posing in front of a Winnebago at San Onofre State Beach with a trio of then-wives and -girlfriends. The photo captures Hynson on the cusp of greatness, about to embark on a nationwide tour to promote the film he’d just starred in, Bruce Brown’s The Endless Summer. On an opposite wall is a black-and-white Warner Brothers production still from the acid-drenched 1972 Jimi Hendrix “concert” film Rainbow Bridge, in which Hynson surfs waves in Maui and cracks open a surfboard to reveal a bag of smuggled hashish. Other photos of Hynson surfing in the early 1970s adorn the walls: molten energy captured in freeze frame, gold locks flowing in the wind, a pair of intensely focused eyes, arms spread out in a yoga-style stretch. What’s missing from this Technicolor trip down memory lane are the past 20 or so years of his life. It’s a stretch of time Hynson doesn’t talk about much, partly because he’s not proud of it, but mostly because he doesn’t remember it well, even less so than the heady days of the late-1960s, when he was dropping acid nearly every day with his friends in the Laguna Beach-based band of smugglers known as the Brotherhood of Eternal Love (see “Lords of Acid,” July 8, 2005). Those were strange times indeed, but a lot of fun compared to what came next. In the early 1980s, life went downhill for Hynson when John Gale, one of the Brotherhood’s best surfers and Laguna Beach’s most legendary outlaws, died in a mysterious car crash, thus ruining Hynson emotionally and financially. Gale was Hynson’s business partner in Rainbow Surfboards, which the two founded in Laguna Beach in 1969, as well as his best friend. Hynson’s drug-addled, rebellious lifestyle had already led to a divorce from wife Melinda Merryweather, a Ford Agency model, actress and art designer, but Gale’s death seemed to push him over the edge from reckless to beyond help. He descended into a depression and drug addiction that lasted decades, ruining his surfing career and alienating him from everyone but his closest friends until only a few years ago. 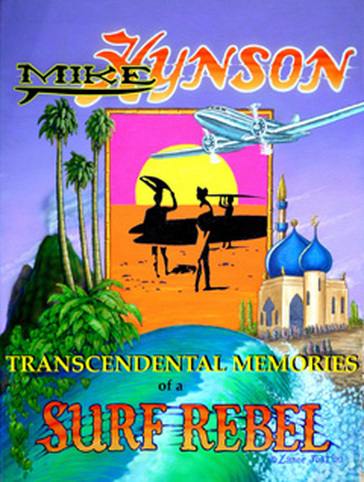 It was during one of Hynson’s numerous jail stints, at some point in the 1980s—he’s not sure what year or why he was in jail—that somebody suggested he use his free time to write, a suggestion that, two decades later, led to Transcendental Meditations of a Surf Rebel, an autobiography Hynson co-wrote with Donna Klaasen that was released this month by the Dana Point-based Endless Dreams Publishing. Among other things, the book divulges that Hynson, who has never spoken publicly about the Brotherhood, wasn’t just pals with them, but actually instructed them in the art of using surfboards to smuggle drugs. “The last time I’d been in jail, I’d started reading for the first time in my life,” Hynson recalls of his autobiographical efforts. “And on this stretch, I just got obsessed with writing.” By the mid-1990s, Hynson had cranked out hundreds of pages of handwritten memoirs, all of it scrawled in pencil on jailhouse paper, which he eventually shared with a few friends at the surf shop down the street from where he now lives, a half-mile from the beach in Encinitas. “A couple of people looked at it and said, ‘Michael, I know you can understand this, but I look at it and I can’t understand a word,’” he says. Hynson remembers glancing down at the first draft of his autobiography. For the first time, he realized that, after the first few pages, his magnum opus consisted of nothing but incomprehensible chicken-scratch scrawl, less a series of words and punctuation marks than a never-ending pattern of zigzag lines, like heart-monitor readings. “It was just so dysfunctional,” he says, chuckling. Unlike the blurry events of the past few decades, the highlights of Hynson’s early life are still very vivid in his mind. Michael Lear Hynson was born in the Northern California coastal town of Crescent City in 1942, a Navy brat whose father survived kamikaze attacks as a radioman in World War II. Mike grew up in San Diego and Hawaii, never staying in one place long enough to make friends. His thrill-seeking lifestyle began while living with his mother at a trailer park when he was just 2 years old. Stealing surfboards is how Hynson met the man who would give him his first big break in the world of surfboard shaping, Hobie Alter, an early surf pioneer and inventor of the Hobie Cat, which is now the world’s top-selling small catamaran. “I first met Mike when he stole some of my boards,” Alter says. “The cops wanted to press charges, but Linda Benson, one of the finest surfer gals, called me and said Mike wasn’t that bad.” Alter agreed to drop the charges if Hynson would return the boards and later gave him a job as a shaper. One person who began following Hynson’s surf career was Bruce Brown, a film director who, by the early 1960s, was filming all the big surf contests in Southern California and Hawaii. According to Hynson, Brown was getting tired of the fact that all the surf movies being made showed the same group of surfers on the same group of waves. “There was no story to any of these movies,” Hynson says. Brown came up with the concept of taking two surfers—one blond and right-footed (Hynson) and one dark-haired goofy-footer—August fit the part—and following them around the world, from California to Europe and Africa, in search of the perfect wave. The details of their epic quest, which culminates with Hynson surfing a beautiful right-breaking wave at Cape St. Francis in South Africa, are familiar to anyone who has seen The Endless Summer, which remains iconic more than 40 years later. The film not only exposed the sport to a nationwide audience, helping export the industry beyond California and Hawaii, but it also helped shift the sport itself from a handful of well-known beaches to a constant quest for pristine waves in exotic locales. Hynson recalls the trip as one of the most fun adventures in his life, although part of the sense of adventure was the fact that he smuggled an ounce of pot with him as he flew around the world. Before the movie was released theatrically in 1966, Hynson accompanied Brown and August, as well as several other surf legends, including Carroll, on a nationwide road trip to promote the film. “We’d go into towns, and every time we’d stop for gas, Corky and I would jump out and go skateboarding,” Hynson says. “We really caused a scene because skateboarding hadn’t reached the inner part of the States yet.” As the trip wore on, the audiences were growing larger, and before Hynson realized it, the movie had become a hit. (At latest count, The Endless Summer has grossed $30 million.) Hynson claims that Brown had promised him and August that if the movie did well, everyone would share in the good fortune. Hynson brought August with him to see the attorney, who insisted they each deserved a third of the profit from The Endless Summer. Hynson claims Brown refused to do that, instead offering each surfer $5,000, a new car and help getting set up in business. While August accepted the deal, Hynson says, he refused. (Neither Brown nor August responded to written requests for comment for this story, but Alter says Brown gave Hynson the gift of fame he still enjoys. “Nobody knew who Mike was back then,” he says. “Bruce took all the risk, and I’ve never met anybody more forthright and honest.”) The dispute ended Hynson’s friendships with Brown and, eventually, August. Enraged by what he felt was Brown’s betrayal, Hynson dropped out for a while, leaving California with Merryweather to spend half a year surfing big waves on Oahu’s North Shore. Before Griggs invited Leary to join his group, which in early 1967 moved south to Laguna Canyon, to a neighborhood Griggs would christen “Dodge City” because of the constant skirmishes with the local forces of law and order, Hynson was Griggs’ most famous disciple. “Griggs had gold flashing out of his eyes and tongue, these words; he was just a magical little guy,” Hynson says. Accompanied by Merryweather, Hynson dropped his first acid with Griggs and several other Brotherhood members at Black’s Beach near La Jolla. 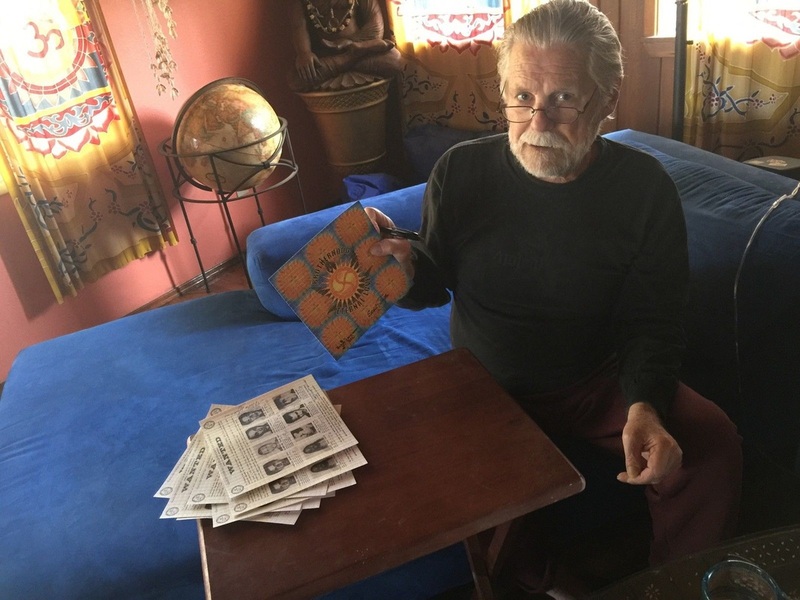 Griggs had a plan: open a psychedelic spiritual and cultural center in Laguna Beach that would turn the town into a Southern California version of Haight-Ashbury. To finance the construction of Mystic Arts World, the store that would serve as that center, Griggs relied on cash from the Brotherhood’s burgeoning marijuana-smuggling operation. But Hynson had another idea for how Griggs could raise money: Why not use surfboards to smuggle hash from the Middle East or India? After all, nobody knew anything about surfing in India, so customs wouldn’t know if, for example, a surfboard weighed 20 or 30 pounds more than it should. Hynson suggested the idea to Griggs’ friend Dave Hall, who promptly borrowed a board and set off for Nepal, returning a few weeks later with the board—and the best hash anyone in Laguna Beach had ever smoked. During the next several years, the Brotherhood of Eternal Love established itself as both America’s top hashish-smuggling ring—with up to a dozen hash-stuffed Volkswagen buses and Land Rovers being shipped back from Afghanistan at any given moment—and the country’s top LSD-distribution ring. Leary moved to Laguna Beach and later accompanied Griggs to a mountain commune in Idyllwild, where Griggs died of an overdose of crystallized psilocybin in August 1969. Hynson stayed away from Dodge City as much as possible because Leary and the Brotherhood attracted too much heat. He let his guard down once, however, when he and Merryweather sped through Laguna Canyon smoking a joint. A cop pulled them over, smelled the weed and arrested them both. At the station, the officer rifled through Merryweather’s belongings. “In my purse, I had a little Buddha, a prayer book and beads, some patchouli oil and incense, and a Murine bottle full of LSD,” Merryweather recalls. “The cop ingested it through his fingers and never got around to booking us.” In the morning, another officer arrived at the station, slack-jawed at the sight of his colleague, who reeked of patchouli, sitting with glazed eyes in front of a Buddha. “They let us the hell out of there right away,” Hynson says. Rainbow Surfboards got an unexpected publicity boost from Jimi Hendrix and Chuck Wein, a member of Andy Warhol’s so-called Factory whom Merryweather had befriended while working as a model in New York. In 1972, while Hynson and Merryweather were living in Maui—where most of the Brotherhood had relocated after Laguna Beach became too hot—Merryweather suggested to Wein that he direct a Jimi Hendrix concert movie in Maui and even introduced him to Hendrix’s manager, Michael Jefferey. “Chuck wanted to make a movie that was going to have surfing, healers, vegetarians, New Age people, even a space woman,” Merryweather says. 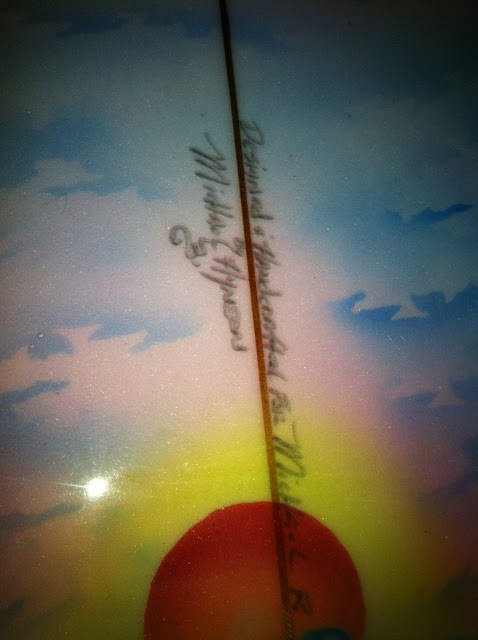 “Jimi was going to play the music because he was at the top of his game, and Michael was going to surf because he was at the top of his game.” The result, 1972’s Rainbow Bridge, was billed as a Hendrix concert film because the concert Hendrix played in Maui provides the ending of the movie, much of which actually features surfing by Hynson and his friends, goofy-foot hotshot Dave Nuuhiwa and Leslie Potts. “Gale refused to be in the movie, because he didn’t want to have his face on camera,” Hynson recalls. On June 2, 1982, Gale perished when the car he was driving, Hynson’s Mercedes, went off the road in Dana Point. Hynson remains convinced someone—either the cops or rival criminals—was chasing his friend. The tragedy ended Rainbow Surfboards (it’s recently been reincarnated under new ownership) and left Hynson financially strapped. “If you ever had a business project and you’re wondering whatever happened to it, it’s probably because the other guy is dead,” Hynson jokes. Nick Schou’s book Orange Sunshine: The Brotherhood of Eternal Love and Its Quest to Spread Peace, Love, and Acid to the World, is scheduled for release in March 2010 by Thomas Dunne Books/St. Martin’s Press.